Taco night can oftentimes be underwhelming and under-appreciated. But done right, and taco night will easily become a family favorite. 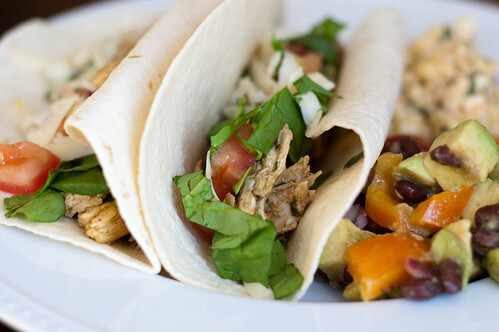 Of course leave it to Cook's Illustrated to turn ordinary chicken soft tacos into a ridiculously delicious meal. And you can eat 2 tacos for only 350 calories! I actually only ate one since we had some delicious and substantial sides to go along with them anyway (Guacamole Salad and Mexican Corn Salad in case you're wondering). In order to produce the perfect chicken for the taco, boneless skinless chicken breasts are poached in a fragrant broth of garlic, chipotle chiles, cilantro, and orange juice. Once the meat is cooked through, it is shredded. Meanwhile the poaching liquid is turned into a flavorful sauce with the addition of Worcestershire sauce and yellow mustard. I know it sounds weird, but always trust Cook's Illustrated. The shredded chicken is then returned to the pan and stirred into the sauce to produce great flavored, but low fat chicken that is perfect for soft tacos, nachos, quesadillas, or salad. Heat the oil in a 12-inch skillet over medium heat until shimmering. Stir in the garlic and chipotles and cook, stirring constantly, until fragrant, about 30 seconds. Stir in 1/2 cup of the cilantro, Worcestershire, and the orange juice. Nestle the chicken into the skillet and bring to a simmer, cover, reduce heat to medium-low, and cook until the thickest part registers 160-165 degrees on a thermometer, about 12-18 minutes, flipping them halfway through. Remove the chicken from the pan and transfer to a cutting board. Shred into bite-sized pieces using 2 forks. Meanwhile, continue to simmer the sauce over medium heat until thickened and reduced to about 1/4 cup, about 5 minutes. Remove from heat, and whisk in the mustard and remaining cilantro. Stir in the chicken, and season with salt and pepper to taste. Serve with warm tortillas and desired toppings. Notice anything different? I got a makeover! I hope you all like the new blog design. There are a few new features worth mentioning as well: I created a recipe index, so recipes should be easier to browse and search. I also created a new page, called Featured Recipes. I'll post several recipes that may be inspired by the seasons, certain ingredients, holidays, etc. Right now I'm featuring summertime fare, and if you are a new reader, you might enjoy reading what I cooked up last summer. I'm also new to Twitter, so check me out there - just click on the little bird cupcakes to the right! And finally, I have a button! If you'd like to post it on your own blog, grab the code! Now onto the burgers. I am slowly but surely getting around to sharing the courses from my beer pairing dinner. I had originally planned to pair the Sweetwater IPA with grilled jerk chicken, but I had a stroke of genius and decided to turn it into sliders. I used a jerk chicken recipe and adapted into burger patties, then grilled them and served with pineapple-papaya salsa. 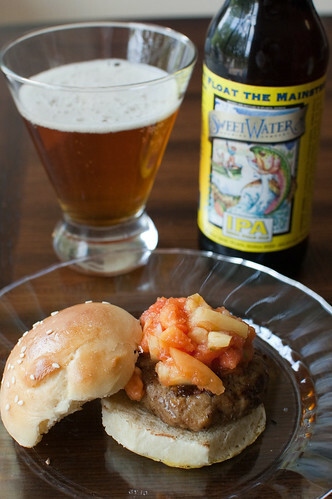 I love serving sliders because I think they are so fun and cute, and they were perfect for our multi-course dinner. Plus, I got to make slider buns, which I love! These had the perfect amount of heat, and they were balanced by the cinnamon and allspice in the recipe and the sweet salsa that accompanied them. A huge perk was also prepping them ahead of time and allowing them to marinate; then I just had to throw them on the grill when it was time to eat. 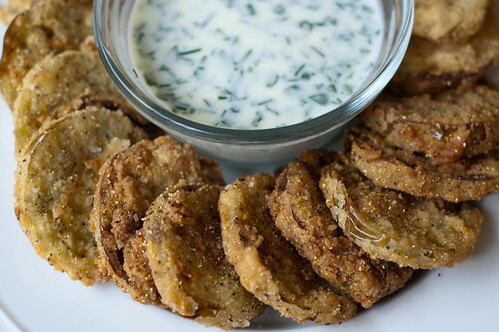 Perfect for lazy summer entertaining! Whisk together the lime juice, soy sauce, olive oil, salt, brown sugar, half the garlic, the onion, and half the habanero peppers. Pour into a 9x13 inch baking dish and set aside. Transfer the chicken to large bowl. Combine the scallions, the remaining garlic, remaining habaneros, thyme, allspice, black pepper, cinnamon, and nutmeg. Pour over the ground chicken and knead gently to combine. Shape into 4-5 patties, and transfer to the marinade. Gently turn several times to cover the meat well, then cover and refrigerate for several hours. Prepare Grill. Remove burgers from marinade and grill until cooked through, 5-7 minutes per side, turning once. Serve with Pineapple-Papaya salsa. Combine all ingredients in a medium bowl, and stir to combine. Cover and refrigerate several hours, or overnight, to allow flavors to meld. Taste and adjust seasonings if necessary before serving. Up until I made this salad, I had never tasted a beet. They always seemed yucky, and though I consider myself to be fairly adventurous in my tastes, I never had the desire to try them. Even though Dwight Schrute loves them (Beets. Bears. Battlestar Gallactica). This summer we joined a CSA, and we've got beets coming out of our ears, so I figured I'd better learn to love them - and now I do! My friend Michelle suggested that I start out eating them in a salad with some goat cheese. She knows I love goat cheese! This recipe is from The Pastry Queen, and she didn't disappoint. Yes, its a little labor and time-intensive for a salad, but I ate this as my dinner, so I didn't mind. If you want to serve this for company, the beets, pecans, and vinaigrette can all be prepared ahead of time. The beets are roasted in a braising liquid containing chicken stock, white wine, sugar, vinegar, onion, and ginger. Quite honestly I'm not sure that it really imparted that much extra flavor to the beets, but it did make for a flavorful component to vinaigrette. Now that I know I love beets, I can't wait to experiment all summer with fun beet dishes! Preheat the oven to 350. Set the beets in a roasting pan or casserole dish. Pour in the stock, wine, brown sugar, vinegar, onion, ginger, salt, and olive oil. Cover tightly with aluminum foil or lid. Roast until the beets are fork tender, about 45 minutes to 1 hour. Use tongs to transfer the beets to a cutting board to cool to room temperature. Reserve 6 Tablespoons of the braising liquid for the vinaigrette. If you want to avoid red fingers, wear rubber gloves. Cut off the stubble and tail, then peel the beet using your fingers or a peeler. Chop into bite-sized pieces and set aside. To make the pecans. Line a baking sheet with foil and spray lightly with cooking spray. In a frying pan set over medium heat, combine 1 Tablespoon of olive oil, the maple syrup, sugar, cayenne, and 2 Tablespoons vinegar. Bring the mixture to a simmer and stir in the pecans. Continue stirring until the mixture thickens slightly and coats the pecans, about 10 minutes. Pour the pecans onto the baking sheet, and allow to cool before breaking them apart. For the vinaigrette, whisk together the reserved braising liquid, lemon juice, both vinegars rosemary, mustard, salt, pepper, and olive oil. 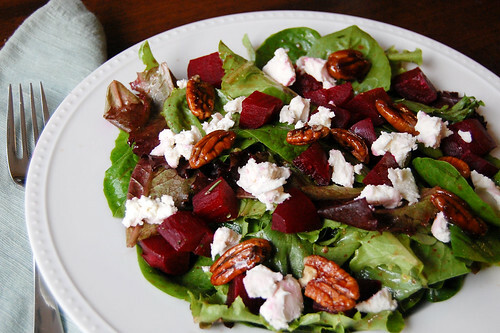 To assemble the salad, Toss the beets with the salad greens and vinaigrette in a large bowl. Divide evenly among serving plates and top with pecans and goat cheese. 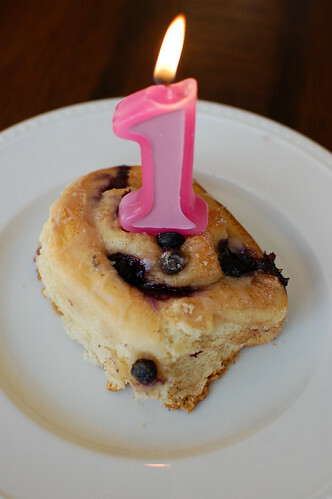 Happy Birthday Pink Parsley - Blueberry Sweet Rolls - and a Giveaway! I can't believe that my little blog is already a year old! So is it called a birthday or a blogiversary? Either way, I'm celebrating! I thought about making a special dessert for the occasion, but then I thought about what I want on my birthday - and that's a good breakfast! So I figured I'd do the same for my blog. I found these blueberry sweet rolls on Tastespotting, and I knew I had to make them. I started them Friday night, then got up bright and early Saturday so we could take them to our tennis match that morning. I always think of cinnamon rolls as being a cold-weather treat, but the addition of blueberries make these particular sweet rolls perfect for summer. 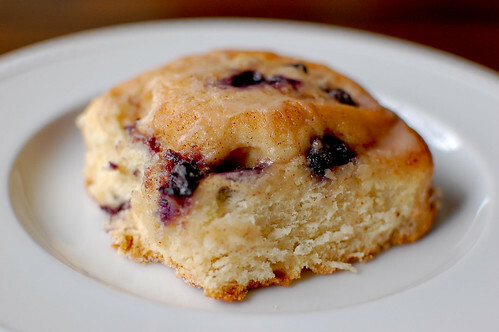 The dough is a rich brioche, then cinnamon, sugar, and flour are sprinkled on along with the blueberries. They are baked, then finished with a vanilla glaze that puts them right over the top. So perfect. I made a few small changes to the recipe, mostly with the technique, and I'm writing my version below. By the way, do you like the candle? I had Joey pick it up at the grocery store, and the cashier asked if someone special was turning one. He tried to explain that my website was... I don't really think she got it, and he was a little embarrassed, haha. Now, on to the giveaway! I feel like part of what defines my blog is my love of southern cooking. The Lee Brothers really exemplify what I stand for and love: fresh ingredients, simple preparations, outstanding flavor. 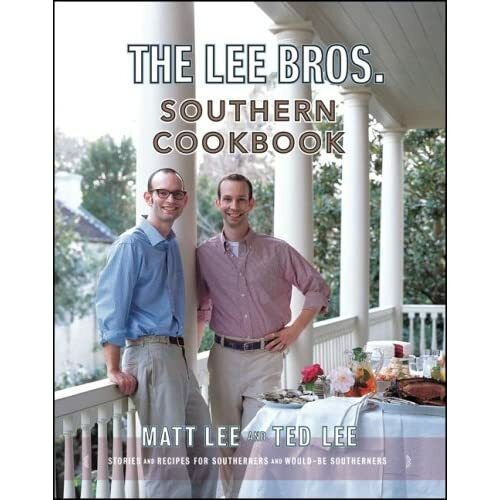 So since The Lee Bros. Southern Cookbook is my current favorite cookbook, As far as I'm concerned, its the Bible of southern cuisine. I could spend hours reading through this, and I pretty much want to make every single recipe. And I'll be giving away a copy to one lucky reader! How about that? My blog turns one and gives you a gift! To enter, leave a comment telling me your favorite southern dish. If you haven't ever had southern food, then tell me a southern dish you'd love to try. The giveaway is open until Sunday, June 13th at 11:59 pm EST. I'll choose one winner at random. I hope you've enjoyed reading my blog over the past year, and I look forward to bringing you many more years of tasty recipes! And now, something I've been waiting to do for a whole year!! Combine the yeast, milk, water, butter, and eggs in the bowl of a stand mixer fitted with the paddle attachment. Add the sugar, salt, vanilla, and flour, and mix to combine. Switch to the dough hook, and knead for several minutes, or until the dough starts to come together, but is still very sticky, adding flour as necessary (I think I kneaded it for close to 10 minutes). Transfer to a lightly oiled bowl, cover with plastic wrap, and refrigerate overnight. In the morning, remove the dough from the refrigerator and allow to come to cool room temperature. It will be very hard, but will soften as it warms up. Roll out on a well-floured surface into a 12-10 inch rectangle. Brush with melted butter. Combine the sugar, cinnamon, and flour in a small bowl, and sprinkle over the dough. Scatter the blueberries on top, and press into the dough. Roll up long-ways, tucking in any blueberries that escape. Use a dough scraper or a sharp knife to cut into 8-10 rolls. Line them in a well-greased square baking dish. Preheat oven to 350. Cover the dish with a clean kitchen towel, and allow the rolls to rise for another 45 minutes to 1 hour. Bake 40-45 minutes, or until the tops are golden and a toothpick inserted into the center roll comes out clean. Place the dish on a wire rack to cool. To make the glaze, whisk the confectioners' sugar, vanilla extract, and milk together until smooth, but not too thin. It should coat the back of a spoon. Drizzle over rolls, and allow the glaze to harden before serving. In the past year or so, I've really come to love greens - kale, collards, and most recently swiss chard. It has a nice fresh, almost lemony flavor, and is definitely milder than kale or collard greens. I really like greens prepares simply: sauteed in some olive oil. This recipe is definitely a little more decadent, and it doesn't really make chard the star of the show, but it does provide a nice light background flavor to an otherwise rich dish. The filling is made up of the chard, sweet peas, ricotta, and cheese. It is then piped into manicotti shells, covered with fontina fonduta sauce, and topped with more cheese. So yeah, not exactly a healthy vegetarian meal. However, I took some liberties with the recipe and slimmed it down where I could. I used park-skim ricotta and mozzarella, skim milk instead of whole milk, and increased both the chard and the peas. I also added a little lemon zest, nutmeg, and crushed red pepper flakes. I realize that its still pretty indulgent, but I'm okay with that every now and then. Even with my modifications, this was still a really delicious meal. With all the greens we are sure to receive in our CSA this summer, I'm glad to have this in our repertoire for a special occasion. Preheat the oven to 400. Spray a 9x13-inch baking dish with cooking spray. Bring a large pot of salted water to boil. Add the pasta and cook until just tender, 5-7 minutes. Drain the pasta and rinse with cold water. Set aside. For the filling: Remove the stems of the chard using kitchen shears or a knife. Chop the leaves into 1-inch pieces. In a large skillet, heat the oil over medium-high heat. Add the onion and cook until soft, 5-7 minutes. Add the garlic and cook until fragrant, 30 seconds. Then add the chard and cook, stirring constantly, until wilted, about 2 minutes. Allow the mixture to cool slightly, then add to the bowl of a food processor along with the ricotta, peas, mozzarella, Parmesan, basil, lemon zest, red pepper flakes, salt, and pepper. Blend until smooth. Spoon the filling into a pastry bag fitted with a large round tip. Pipe the filling into each shell and line them up in the prepared bakign dish. For the fontina Fonduta sauce: In a medium saucepan, bring the milk and cream to a simmer over medium heat. Reduce the heat to low, and add the fontina. Cook, stirring constantly, until the cheese is melted and the mixture is smooth. Remove from heat and stir in the Parmesan cheese, nutmeg, and basil. 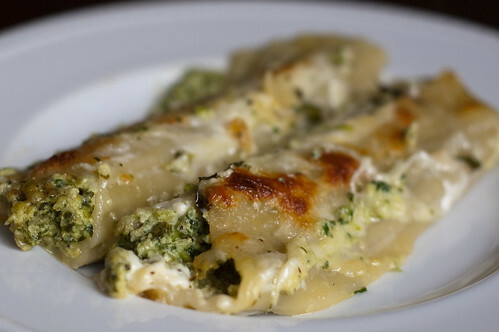 Pour the sauce over the stuffed manicotti and sprinkle with 1 cup of mozzarella cheese. Bake for 30 to 35 minutes, until the top is golden. Allow to rest 5 minutes before serving. While planning our beer pairing dinner, I knew I wanted to do a seafood first course. 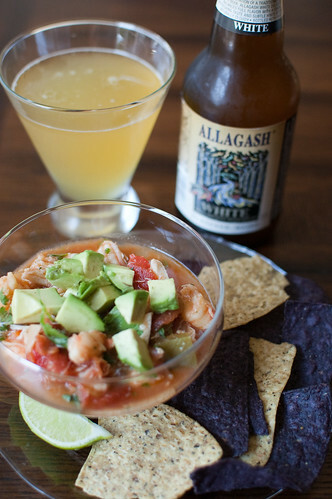 First of all, the Allagash White that Joey chose is a nice light beer - a "patio beer" if you will - and I wanted to pair it with a nice light dish to complement it. I also liked the idea of serving a cold first course. I could completely prep it ahead of time; I even portioned it out into serving dishes. When everyone sat down to eat, all I had to do was top with avocado and garnish with tortilla chips and lime wedges. This was probably my favorite dish of the night. Campechana is kind of a "seafood salsa." The aromatics are sauteed with the shrimp, then simmered in a flavorful tomato sauce made up of Rotel, V8, and ketchup. Horseradish, lemon and lime, and crabmeat are then folded in, and the mixture is refrigerated overnight. Before serving, cilantro, parsley, and avocado are added, and its eaten like salsa: with tortilla chips and lime. its also just as addictive as salsa! 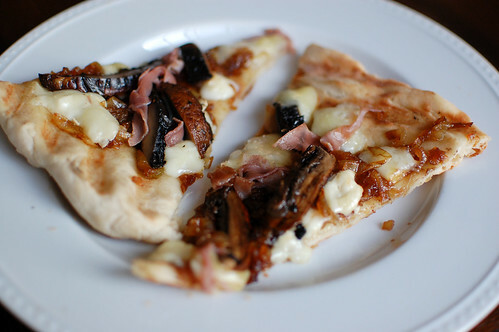 Its a very simple dish to put together, but seems impressive. I will definitely be making this again and again this summer! serves 8-10 as a main course, double as an appetizer. Heat the oil in a large pot set over medium heat. Saute the onion, bell peppers, and garlic. While the vegetables cook, combine the salt and cayenne in a small bowl. Cut each piece of shrimp into 3 pieces, and add to a large bowl. Toss with the cayenne/salt mixture. Add the shrimp to the pot and saute over medium-high heat for 2 minutes. Add the V8, Rotel, ketchup, and Worcestershire sauce, and bring to a simmer, about 5 minutes. Remove from heat and stir in lemon, lime, horseradish, and crab. Refrigerate until cold, preferably overnight. When ready to serve, peel and pit the avocados and cut into bite-sized chunks. Gently stir in the cilantro and parsley, and ladle the campechana into small bowls or wine glasses. 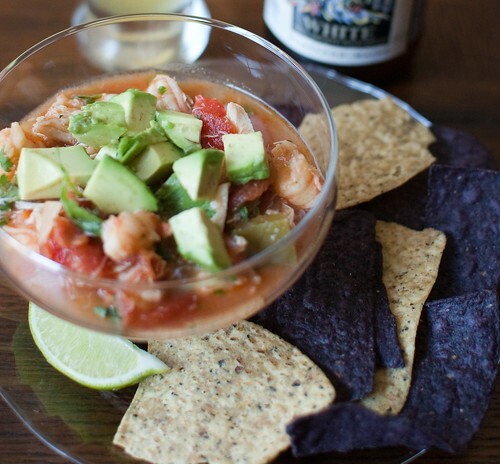 Top each serving with avocado, and serve with lime wedges and tortilla chips. I have had a bit of an obsession with the Lee Brothers recently. It all started last summer, when I made Cornbread Salad. Then it got a little out of control when I tried their Strawberry Wine Coolers. As of now, I have about 5 of their recipes waiting to be blogged.... so yeah. Just slightly obsessed. But seriously, who wouldn't be? They have pretty much perfected southern cooking without relying on too much butter, lard, fat, etc. 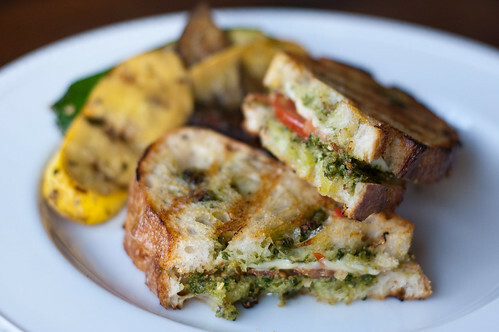 They make it what it should be: fresh ingredients, simple preparations, fantastic flavors. 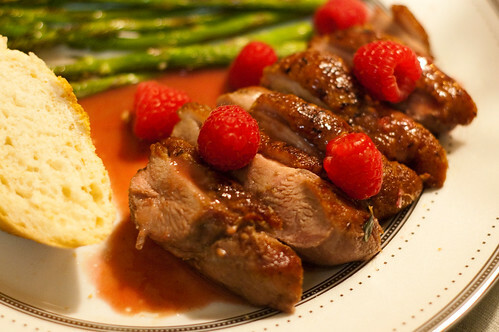 This duck breast isn't necessarily a "southern" recipe, but it is decadent and delicious. 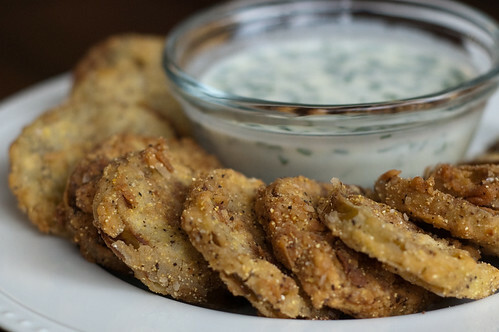 When I first bought Simple Fresh Southern, this was the first recipe that jumped out at me, and I'd been waiting for a special occasion to make it. I made this for our anniversary dinner a few weeks back, and Joey said it was the highlight of the meal. I was really nervous to make duck, but I had no reason to be. Just make sure your skillet is nice and hot, and get a good sear on the skin. I overcooked mine a bit, but it was still nice and juicy. That's the good thing about duck - it has enough fat to be able to handle being a little overcooked. I loved the raspberry-rose' sauce too. It gave the duck a nice sweet contrast to the rich meat. This is most definitely a special occasion meal, and I look forward to celebrating again with it! Place the duck breasts on a small cutting board, and pat them dry with paper towels. Score the skin and fat in parallel diagonal lines, making 4-5 1/4-inch-deep cuts on each breast. Season both sides with 1/2 teaspoon salt and the pepper. In a small bowl, toss 2 1/2 cups of the raspberries with the shallot, thyme, vinegar, oil, and remaining 1/4 teaspoon salt. Save the rest of the raspberries for garnish. Heat a large cast-iron skillet or ovenproof pan over medium-high heat. When a drop of water sizzles in the skillet, add the duck breasts, skin-side down. Be careful not to crowd them, and sear until the surface is golden-brown, 4-6 minutes. Turn the duck breasts over, and spoon off all but about 2 Tablespoons of the fat. Scatter the marinated berries among them, and roast 6-8 minutes (6 minutes will be on the rare side, 8 will be closer to medium-rare). Remove from the oven and transfer the duck to a cutting board and loosely tent with foil. Add the wine and sugar to the skillet and cook over medium-high heat, scraping the bottom of the skillet with a wooden spoon. Cook until the berries have collapsed and the wine has reduced to a thick syrup, about 2-3 minutes. Strain the sauce through a fine-mesh strainer. 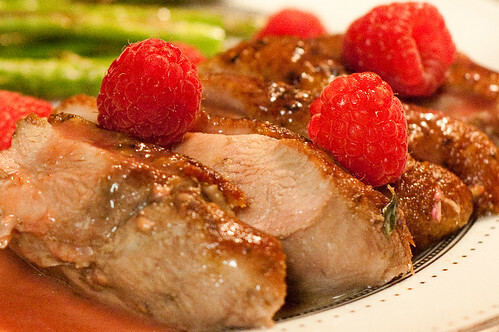 Slice the duck breasts on the bias and serve them bathed in the berry sauce. Serve with reserved raspberries. 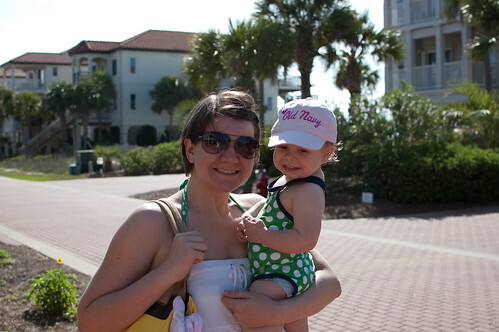 Several weeks ago, we went to St. George Island with Joey's family for a week-long vacation. We spent a wonderful week just relaxing on the beach, playing with Caroline, going for runs, and I read some great books. While we were there, I was put in charge of meal-planning, a task that I was very excited to be given! Our last night there, we picked up some fresh gulf shrimp to grill, and to me, they were the highlight of the meal. I wish I had taken a picture of them, as they were so delicious, and I'm sure I"ll never be able to recreate them the same way up here. 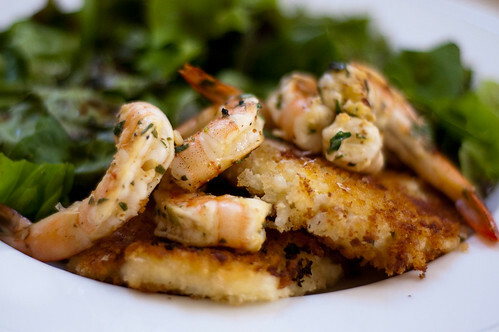 However, Ina's Herb Grilled Shrimp come pretty darn close. The marinade is a cinch to throw together, and they are incredibly flavorful. 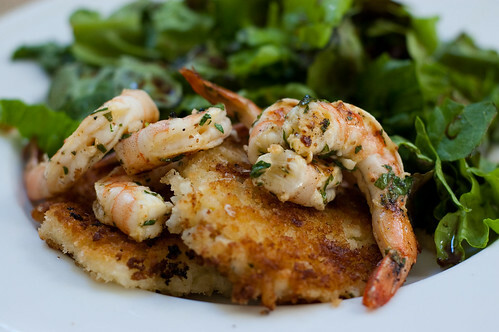 I served them over her chive-risotto cakes and a big salad, but I think they would be wonderful on their own as an appetizer. I used Cook's Illustrated's trick of sprinkling one side of the shrimp with a little sugar before grilling, and it gave them a great char and really brought out the sweetness of the shrimp. Thanks to Penny of Lake Lure Cottage Kitchen for choosing this recipe. It brought back some wonderful memories of our beach vacation, and it was a wonderful choice for May! Prepare grill. Thread the shrimp on skewers, and sprinkle one side with sugar. Grill the shrimp, sugared side down, for about 2 minutes, then flip skewers and grill until cooked through, an additional 1-2 minutes.